We all have those messy days sometimes. Those are the days of spilled milk, trails of Cheerios, and splashed bath water. 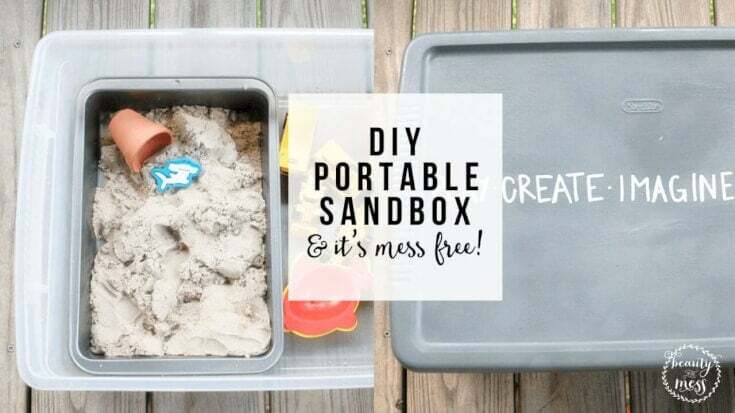 It’s on those days that I truly appreciate a mess-free activity like this DIY Portable Sandbox. 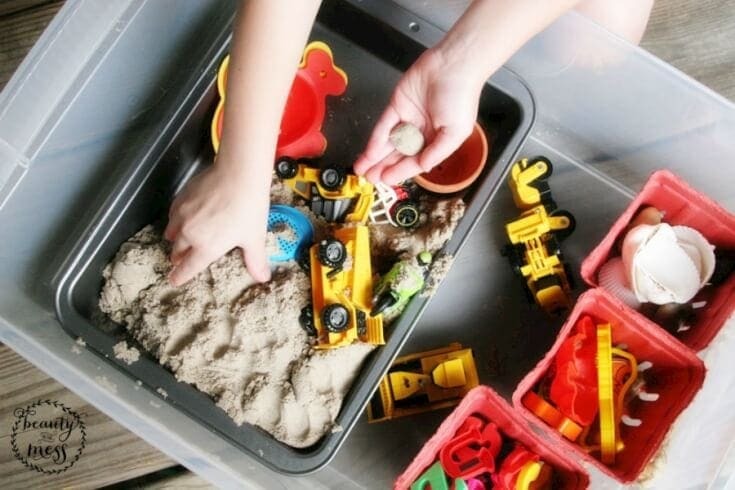 A mess-free sandbox? For the most part, yes. In its typical play state, it’s an easy to clean-up activity that may be exactly what a mom needs. Even though I love the hands and feet that make the messes, I still get tired. I have busy days when the to-do list is long, and sometimes a simple activity that inspires creativity is a great solution. 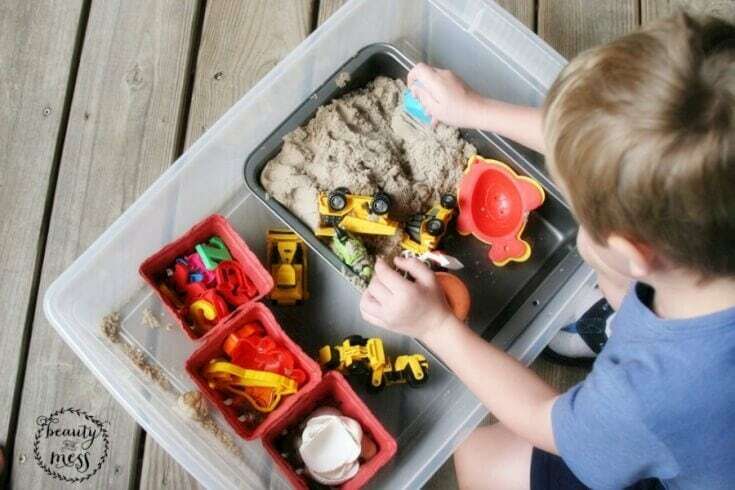 This DIY Portable Sandbox is a project that anyone can tackle. In fact, I recruited my 5-year-old to help. Many days when I need to work from home, we head out to the deck. I’ll pull out our sandbox and the kids will spend hours playing. 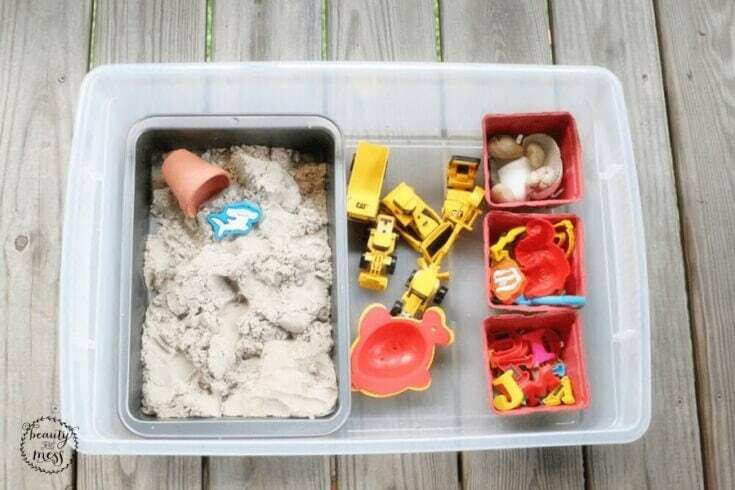 The sandbox is actually filled with Kinetic Sand, which is different than traditional sand. Instead of sticking to people, Kinetic Sand sticks to itself. This means that after play time, the kids aren’t covered in sand from head to toe. Plus, Kinetic Sand can be squeezed, pulled and shaped since it naturally sticks to other pieces of sand. You don’t need to mix in water in order to build a sand castle, for example. My son received Kinetic Sand as a gift and I wasn’t really sure how to store it after we opened the box. 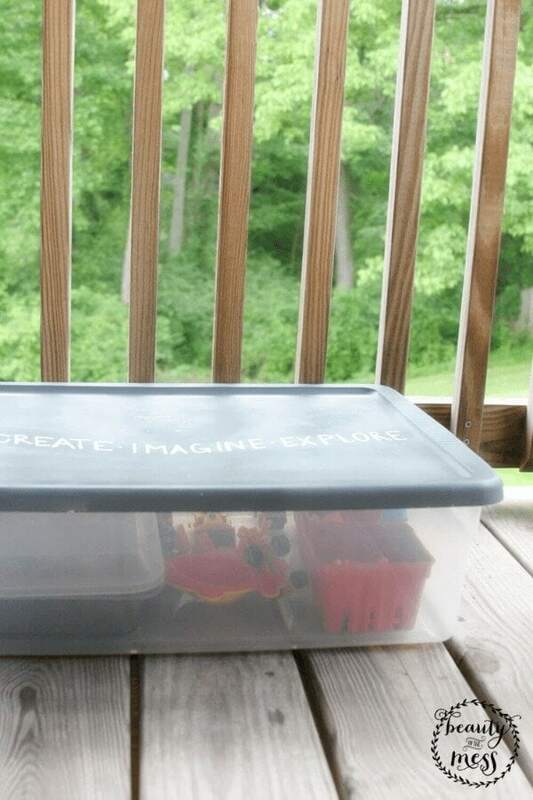 As a quick solution, I used a lidded baking pan to hold the sand and set it inside a larger plastic storage tote. It was a quickly made decision that has turned out to be the perfect activity box. We leave it on our deck and the plastic box is weatherproof. If sand spills out of the baking pan, it lands inside the storage tote instead of on the deck. 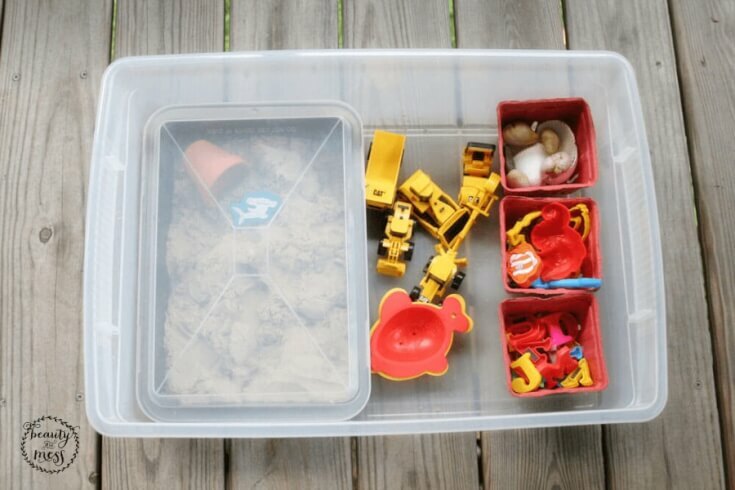 When playtime is over, the sand and toys all fit nicely inside the plastic container. Since it’s been such a hit, we decided to make the storage box a bit more kid-friendly. You may be familiar with Martha Stewart Vintage Decor Paints which work on practically any surface, including plastic. It’s a chalk paint that I’ve used before (on this console table makeover for our Entryway) and still had on hand. After covering the storage tote’s lid in a few coats of charcoal, I used a chalk marker to add playful words and personalize it for the kids. 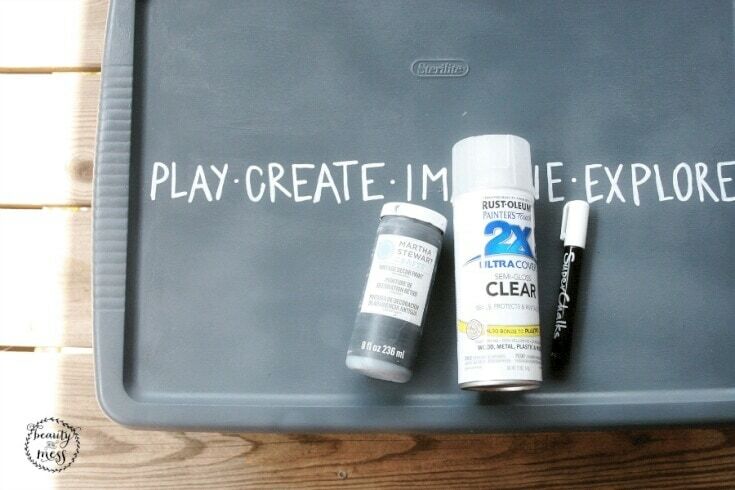 In order to keep the chalk marker from smearing or fading over time, give it a coat of protective clear spray paint. As a note, chalk paint is not the same as chalkboard paint. However, that doesn’t mean you can’t use a chalk marker. In fact, a chalk marker will write on many surfaces, but it may not be erasable. I like to use chalk marker in the same way that a paint pen is used: to add detail, text or decoration to a craft project. If you are talented with a paintbrush, a marker isn’t necessarily needed. 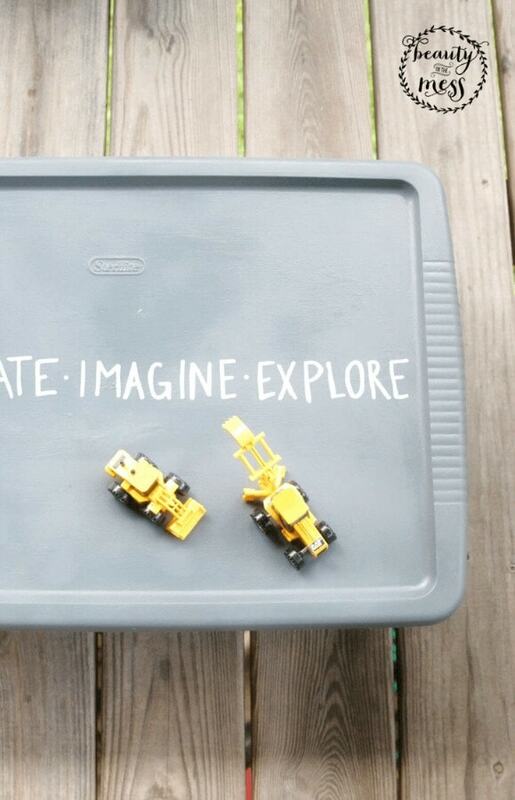 Our sandbox is filled with beach-themed toys, letters, and construction equipment. My son buries seashells and rocks underneath the sand using the dump trucks and excavators. The letters (magnetic, typically for the fridge) work like Play-Doh shapes and can be pressed into the sand to create words. Ocean animals give it a beach theme to inspire pretend play. We leave the sandbox on the deck, but have moved it to the front yard when we’re working in the flower bed. It can be brought inside or over to a friend’s house. It’s portable, functional and flexible for a family. I love that this activity lends itself to creativity. It’s that trait that makes it something the kids can enjoy for hours. 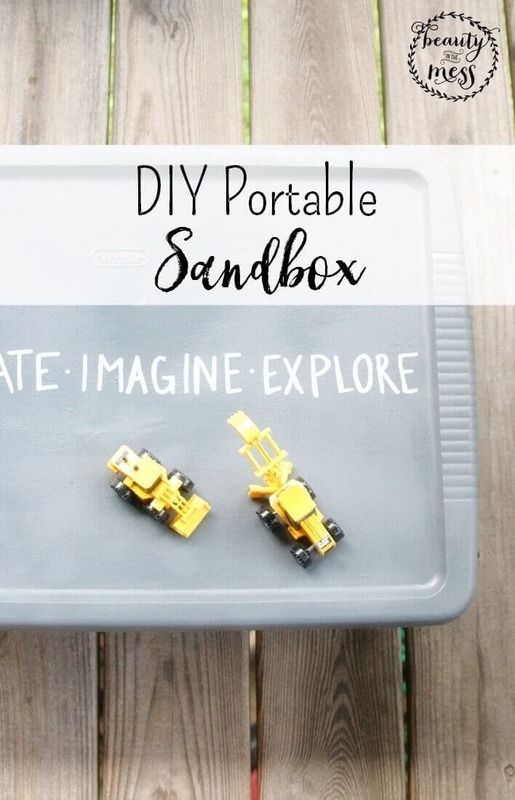 This DIY Portable Sandbox really does encourage the kids to Play, Create, Imagine, and Explore. Some days go smoothly, and a messy craft may be right up my alley (like greeting cards made from a child’s painting). But on the days when there is work to be done, this activity is a great option to keep them entertained and mess-free. 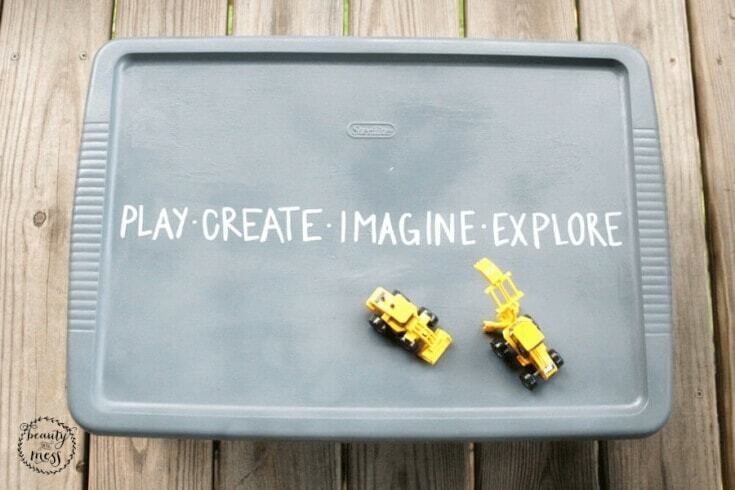 How are you encouraging your children to play, create, imagine, and explore? 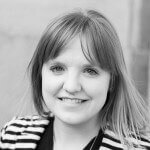 My name is Lora Green and I blog at Craftivity Designs, where I document how we are creating our home. 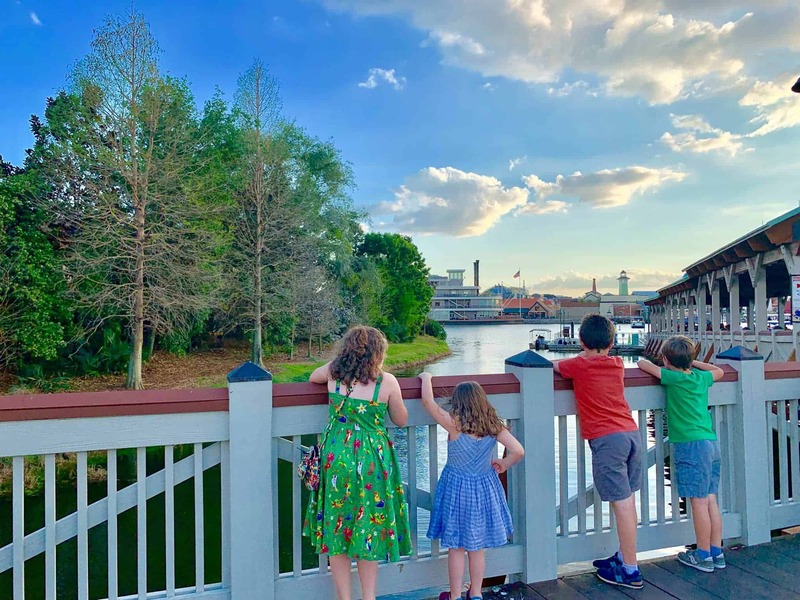 I believe that a home is about much more than design and decor–it should tell the story of a family. Our home should fit the needs of two small kids, a work-at-home mom, and a youth pastor dad. I want it to be a beautiful space, but it must be functional and meaningful, too. 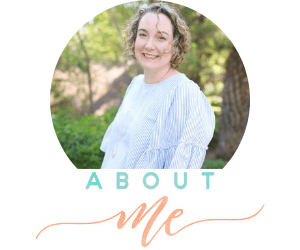 If you are trying to meld function and beauty, join me over at Craftivity Designs and share in this journey of creating a home. This is adorable, frugal and imaginative. I love how we can assemble everything in one neat box we can carry anywhere. Thanks!! 🙂 Glad you stopped by! What a great idea! I think I’m going to make one for each of my boys. The baking pan is such a great idea for storage of the sand, and I love how you decorated the outside container. Thanks!! Your boys will love it! What a great idea!!! I need to make one for my little man! 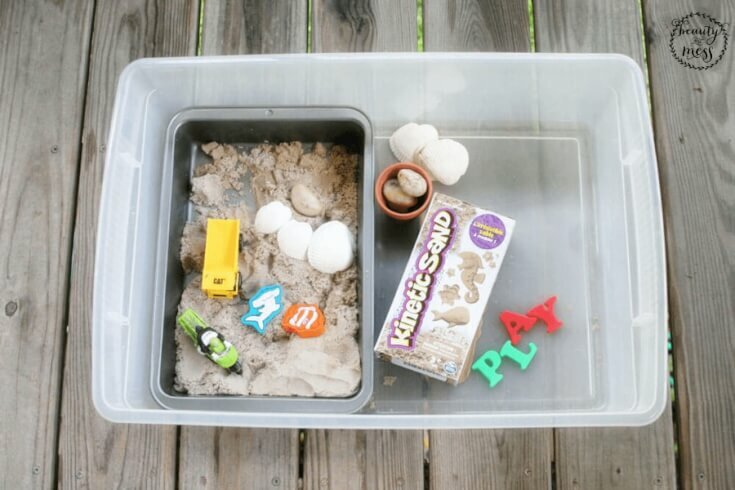 I really love this idea to store kinetic sand and pull it out as a fun activity to occupy my toddler from time to time. I havn’t had much success with the traditional style sandpits in the past so this will be a good alternative. thanks you!